I consistently give the issues I’m reviewing on this blog a high score, with almost all of them ranging from 6.5-8.5 on a 1-10 scale. This isn’t just because I’m trying to be nice. 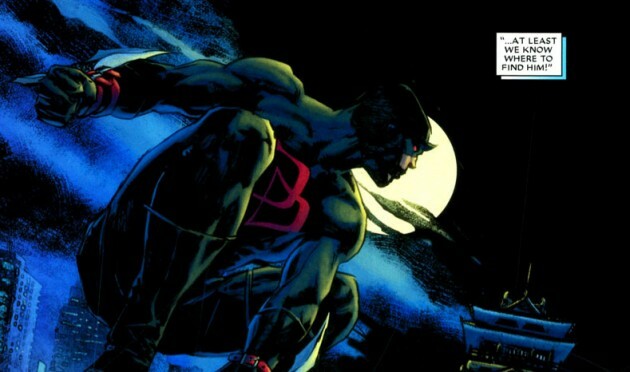 True, I may be one of those glass half full kind of people, but I’m also a spoiled Daredevil fan. Daredevil is an amazingly solid read, month in and month out, and even the issues that don’t knock it out of the park for me (such as last month’s Daredevil #507) are still by no means a bad read. However, when I sat down to review this issue I found myself wishing I could add a couple of points to the scale. It was that good. Great pacing, nice character work, good story progression, and plenty of exciting intrigue. I found myself completely invested in this story to the point where I wanted to yell at the characters on the page to warn them or set them straight. Where Shadowland #1 was larger in scale and added some crucial pieces to get the event puzzle started, Daredevil #508 takes us under the surface, and down on the streets in some really satisfying ways. Before getting to the writing, I have to give extra props to the art team of Roberto de la Torre (pencils and inks) and Matt Hollingsworth (colors). 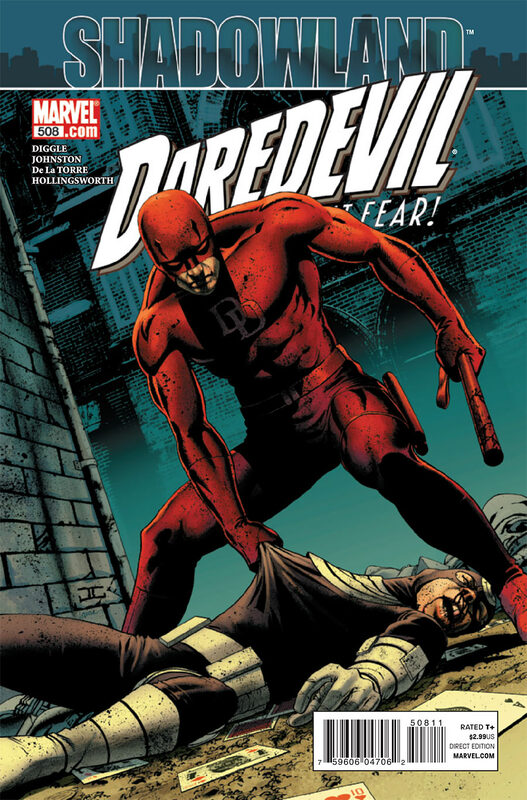 I’ve been a fan of de la Torre’s work on Daredevil since his very first panel, and this issue doesn’t disappoint. Combined with Hollingsworth’s pitch perfect color palette, the streets of Hell’s Kitchen come alive. You can almost taste the nighttime atmosphere and feel the chill in the air. There are a couple of places on the first few pages where Dakota’s and Becky’s faces fall short of the standard set by the otherwise top notch artwork in this issue, but de la Torre’s excellent sense of proper anatomy and perspective shines in almost every single panel. In fact, my only real complaint – and we’re in nitpicking territory right now – is that Becky Blake (still) uses a wheelchair that looks like it came from a 1970s veteran’s hospital. One of the things that really helps this issue take off is that we get the chance to be reacquainted with Daredevil’s extensive gallery of supporting characters. Matt’s civilian friends are back, as are Detective Kurtz and Master Izo. We even get a surprise visit from a certain someone from Matt’s past in a final page that had me all giddy. Daredevil #508 shows us the reactions of Matt’s closest friends to his killing Bullseye in Shadowland #1, and what happens when they try to seek him out to confront him. We also get a different “common man’s” perspective from Dakota’s cop friend Detective Kurtz who fills a role here that is usually filled by someone like Ben Urich. He relays the mood of the people living under The Hand’s control and gives us a sense of the wider picture. We learn that the police have officially withdrawn from Hell’s Kitchen – in one of the few slightly illogical developments this issue – and that people live in constant fear of the new powers that be. This information rounds out the issue nicely, and provides some extra depth to the story. The consequences of White Tiger’s status as a double agent starts having some pretty dire consequences this issue when she comes head to head with Foggy and Dakota, as well as when we see her trying to manipulate Matt, in ever so subtle ways. As much as I like Angela, and would love for her to one day be able to go back to playing nice with the good guys, having a traitor smack in the middle of the story does add a lot to the intrigue. Black Tarantula, meanwhile, is mentioned this issue, but not seen, and it will be very interesting to see what lies ahead for him. He is quite possibly the only character in The Hand’s rank that isn’t morally bankrupt at this point. I know lots of people who regularly review comics try to stay away from other reviews, as well as message boards, in order to keep themselves free from outer influence. I’m the other way around myself. Hearing what others have to say, whether I agree with it or not, helps me see things from new perspectives. Having said that, I must say that I’m surprised to see people being so dead sure about what’s going on in one of the issue’s more controversial scenes – the one which sees Matt go through a very real inner struggle with some decidedly mystical overtones. One verdict seems to be that Matt is now clearly possessed by a demon, this is a cop-out by writers Andy Diggle and Antony Johnston, and the event is now boring and pointless. Needless to say, I don’t agree with any of these points. In fact, one of the things I appreciated about this issue was how well it kept the mystery of The Hand’s machinations going. It has been very clear from Daredevil #507 and onward that Matt must fall prey to his own weaknesses, and not outside influences. At the same time, something “mystical” will clearly happen once he does. This particular scene is perfectly in line with this previously hinted at scenario. It also contains many of the elements we remember seeing during Matt’s recurring dreams. I quite liked the scene for several different reasons: It is beautifully illustrated, delivered with just the right amount of ambiguity, and also serves to foster some level of sympathy for the main character. The latter is absolutely vital to this kind of story, in which an occasionally misguided though generally decent hero takes a trip to the dark side. With so many things happening in this issue, I’m incredibly excited for next month, which sees not only new installments of Daredevil and Shadowland but the premiere issues of a whole list of one-shots. I will cover every single one of them right here on the blog, so if you’re not reading all of them, you don’t have to worry about missing the bigger picture. I just had a chance to catch up with Shadowland so my comments may mix with Shadowland 1. The moment when Matt is loosing his composure (508) is priceless. One wonders if it is because he is winning the fight inside him or loosing it. I will say however, he just got that new costume and now the mask is ripped. The hand costume maker is going to be pissed; he just finished putting horns on every ones outfits. I thought the art and colors in 508 were sweet and Tan’s work in SL #1 wasn’t bad at all. For some reasons “events” seem to draw out bad art. (I’m reminded of the guy from the Skrull Invasion who couldn’t draw women’s hair unless it was blowing straight back from their heads. Goofy.). Tan is about 15 x better than that on his worst day. I, for one, am not on board with the DD killing Bulls thing. I like the idea of Matt being stretched, pulled, and pushed, and always coming out with his moral compass pointing north. On the other hand, the idea that Matt and Elektra are uniquely challenged by mystic corrupting, like a Jedi turning Sith, is a fruitful path. Having said all that I’m not so sure Matt’s moral compass it isn’t still pointing north. Are we all sure we saw what we though we saw in SL 1??? I’m intrigued with the White Tiger angle, the Master Izo angle, the angle with his friends (super-powered and otherwise) trying to save him, and the angle reveled on the last page of 508. I’m invested and I’m scared!!! I’m still struggling a bit to completely enjoy Shadowland, I think because of my huge expectations for it, but I will say that I enjoyed the artwork on Daredevil 508 a lot more than the one in Shadowland 1. My, this book is so much more fulfilling than was Shadowland (SL) #1! Still, I can’t say I came away thinking it was *great* like Christine. When I saw Christine’s tweet that this was her favorite issue of DD in years, I sat down and re-read both SL and this issue. While I can pick out several issues of DD that I have enjoyed more in the last few years (111, 112, & 500 off the top of my head), I really do think this is top notch stuff. The book works best with Foggy, Becky, Dakota, Ben Urich, et al. playing a big role, especially when they’re written this well. I suppose my biggest complaint with this issue is that it failed to answer the questions I had from SL #1 that I assumed would be treated in DD, e.g., approximately how much time has passed since DD #507 and SL #1. That oversight really bothers folks like myself who are obsessed with minor details. (Also, I worry that the thieves hung up on the lamppost will die since no cops are walking the streets of Hell’s Kitchen to cut them down and give them medical treatment.) I’d say 8.0/10. People’s opinions seem to be all over the place when it comes to both Shadowland #1 and this issue, though most rank Daredevil #508 higher. I’ve had pretty high expectations for this event, but there’s been some apprehension as well. It takes quite a bit of skill on behalf of the writers to take the character in this radical new direction without “ruining” him (at least in the short term). I’m actually surprised to realize just how much this whole storyline works for me, and this issue in particular really did. I absolutely loved it. Best in years? The only other contender for me here is Daredevil #500, but that was an over-sized anniversary issue so, page for page, this issue did give me more bang for my buck. 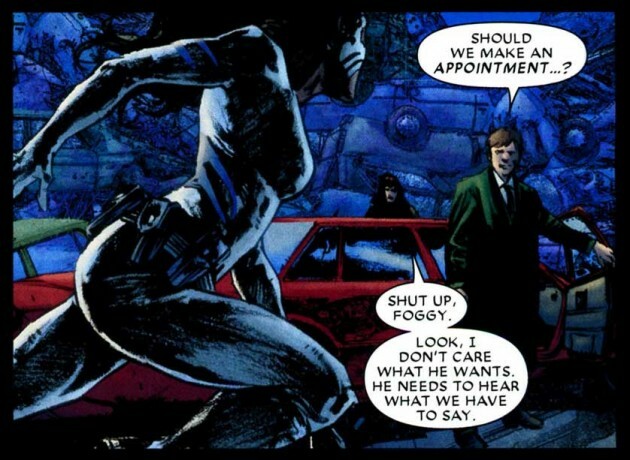 For me personally, Brubaker’s work actually took a dip in quality with the introduction of Lady Bullseye, though I know many feel the opposite. I’m not much of a ninja fan generally which makes my enjoyment of the current developments even more surprising. Still, one of the things that absolutely needs to be addressed is what happened between Japan and now. It wouldn’t surprise me if we get one of those “weeks ago” flashback scenes in either next month’s Shadowland or Daredevil. If this event runs its course and we never find out, that will be a pretty serious flaw. I just ordered this… it and Shadowland 1 are taking longer to get here than I thought. bad at avoiding spoilers anyways, so good review. I too found it confusing that people are just dismissing as just a “hero is possessed” story. They went out of their way to tell us that Matt must do this to himself in order to work. 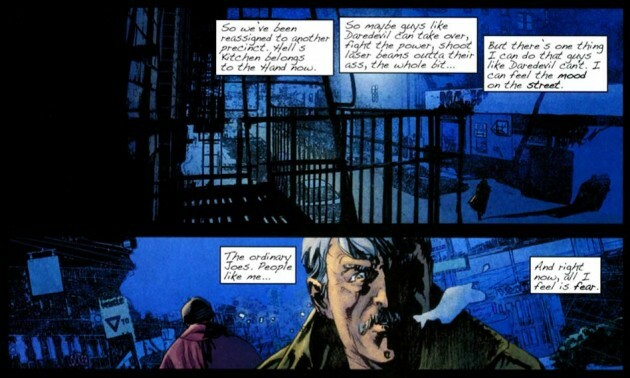 The only thing I didn’t like about this issue was the fact that there was an actual barricade around Hell’s Kitchen. I don’t care if you have an army of ninja at your disposal, if you pull that kind of stunt, you are going to draw the attention of the army, the Avengers, etc. It would have worked far better if it had been a less-literal barricade, with members of the Hand patrolling the limits of the area. Christine, you practically echo my thoughts. Excellent review, too, as usual. I loved the ending, got me a little giddy as well! A new possibility presented itself to me and the obviousness of it made me question whether everyone else has already figured this out yet. So, I’ll ask all the esteemed DD readers out there. Forget whether Bullseye is dead or alive: isn’t it likely that Bullseye’s “death” is merely a necessary step for his rebirth into the Hand? Though you wouldn’t think it, the Hand seem to be rather sentimental ninjas. Whenever someone has to die for them to be reborn in the Hand, the ninjas like to stab that person through the chest, ideally with a sai, though a longsword or six adamantium claws will do. They just like the symbolism. See, e.g., White Tiger, Wolverine, Northstar, Erynys (self-impaled), Gorgon (self-impaled), Elektra (presumed), and Black Tarantula (presumed). So, more simply, is this simply Matt’s means of bringing Bullseye into the Hand as his chief weapon/assassin? Not only would this add an effective tool to Matt’s arsenal, but it would remove Bullseye as a threat by subjecting his will to that of the Hand, i.e., to Matt’s. It almost makes too much sense to NOT be the correct answer. P.S. Christine, this post is not tagged as “Shadowland” and thus does not show up if one clicks on the header on the main page. Personally, I wouldn’t mind Bullseye being dead for good. True, he is a great villain, but it would be nice to occasionally see dead (or presumable dead) characters stay that way. However, with how comic books work, we can only assume that he’s either not really dead or only temporarily dead. I’ve seen people toss around the idea that the Hand might resurrect Bullseye, but you’re probably the first (that I’ve seen anyway) to suggest that this has been a deliberate plan. It’s an interesting idea. What do the rest of you guys think? I absolutely agree. My biggest concern with this event is actually that it’ll end with Matt dying and being resurrected. I’m not saying that something like that couldn’t be written in a way that I’ll still like the bigger story, but it’s SUCH a cliché. I personally figured a genius lawyer like Matt was plenty smart enough to resurrect someone he’s accused of killing. It’s the perfect courthouse reveal, after all. But I was also thinking that Matt is just crazy enough now to figure “people who are resurrected by the the Hand are controlled by the Hand! Since I control the Hand now, I can *force* Bullseye to be a good guy!” Matt may honestly have had that in mind. What would you do if the power of life and death were in your hands?